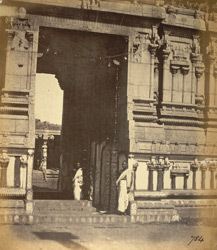 Photograph of the entrance to the Kailasanatha Temple at Tiruchengodu in Tamil Nadu, from the Archaeological Survey of India Collections, taken by an unknown photographer in the 1870s. The town of Tiruchengodu is situated at the foot of Nagagiri ('Serpent Hill'). The Kailasanatha Temple was begun in the Chola period but most of its architecture belongs to the Vijayanagar period. The entrance gopura, or gateway, was built in 1664. This view shows the entrance through the base of the gopura that leads into the temple enclosure. The outer walls of the gopura are decorated with mouldings and pilasters, some standing in pots.